Hendersonville Muffler Company does not work on cars and trucks. We FIX the cars and trucks of Hendersonville. Tennessee. Hendersonville Muffler Company is very experienced at trouble code repairs. We used to repair the fuel injection and emission systems before cars had trouble codes. In 1968 Volkswagen had the first on board diagnostic system on the air flow controlled fuel injection system on the type3 models. In 1980 General Motors starting using a system they named the ALDL or Assembly Line Data Link Connector to check the ECM while on the assembly line and to help technicians diagnose the electronic control systems on cars and trucks. In 1991 the California Air Resources Board required all vehicles that were sold in the State of California had to have an on board dignostic system. Automotive repair shops started buying small computers called scanners to read the information and trouble codes and help the technicians repair the electronic systems on cars and trucks. The main problem with this system was that every manufacturer designed the system differently and repair shops had to buy new equipment for each car or truck manufacturer every year. In 1996 a new system of diagnosing the trouble codes came into existance world wide called OBD2. The OBD2 system allowed technicians to test any car with the same connector. The new system made it so that more people could afford scan tools. Unfortunately it did not make everyone a better technician. Almost every auto parts store has a code reader and the pimple faced kid at the parts store will gladly sell you a part based solely on a trouble code. 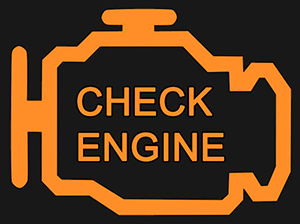 The technicians at Hendersonville Muffler Company have access to the eighteen REAL scan tools in our shop to help repair the check engine light problems for the people of Hendersonville, Tennessee.